Who doesn't love a good deal? More importantly, what Israeli (even if they're Anglo) wants to be a frier and pay full price for anything? 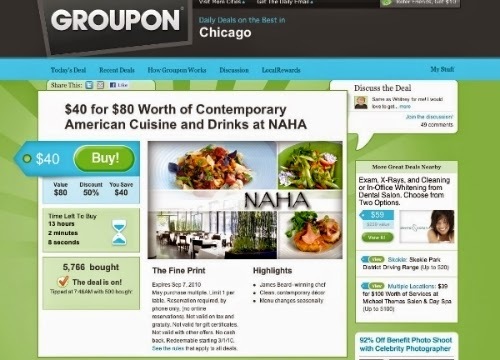 Since 2009, when the concept of online group purchasing first reached our shores from the US, Israelis have been able to enjoy the deep discounts offered on a variety of items and services at the many, many websites of this type, the archetype of which is Groupon Israel. There are even coupon sites for specific sectors of the Israeli public, such as Group-E for the religious, Mamibuy for parents of young children and Anglo Deals for us English speakers. Initially, these websites engendered a lot of enthusiasm, which caused much frivolous spending and more than one missed opportunity to actually use all the vouchers we'd purchased. Every day, we'd get numerous emails from the various coupon sites we'd signed up for, cluttering our inbox and dangling tantalizing deals for more and more stuff. But eventually, it all just seemed like too much. After a few months, I heard various friends of mine say they'd unsubscribed and given up using Groupons, because they were spending way too much on things they really didn't need. Well, because - by my own previous admission - I have shopaholic tendencies of my own, I realized some ground rules needed to be established for the sake of my sanity and bank account. Here's what I came up with that works for me; I'd love to hear how you use Groupons to your best advantage in the comments. Make sure it's really a deal. Just because the website claims that the list price of whatever doodad it is you want to buy is NIS 499 doesn't mean that's actually what it'll cost you in stores. Check a price comparison site such as Zap to see how much it really costs. Use cashback . Both Groupon and Baligam offer cashback on your purchases through them. No more daily emails! I mostly search for Groupons when I need or want something typically found on such sites. Otherwise, I find myself buying "only this" for "only NIS 59.90". If I buy a coupon and the website starts sending me daily emails again, I unsubscribe immediately. Use an aggregator. There are several sites which aggregate deals from many different coupon sites. My personal favorite is GetItAll, which not only has many hundreds of deals from tens of sites, but also is searchable by area of the country, type of Groupon, % of discount and other parameters. You can sign up and get your pick of the daily deals from the aggregator in a single email, but I prefer not to as I find the temptation too great. Don't waste your money on cheap "As Seen on TV" Gadgets from China. If you really want one of those and have a reasonable amount of patience, you're much better off ordering one locally, or directly from China yourself (more on that in another post). For example, I saw this Pedispin in a shlock store on Jaffa Rd. in Jerusalem this week for NIS 10. Compare that to the cost on a coupon site. And it's always prudent to check out the Amazon Reviews before buying anywhere to make sure you're not getting an inferior product. Groupons are best used for services, travel, hotel or restaurant deals, or for cheap tickets to attractions and shows. Namely, things you can plan for in advance and probably only do once in a while. Probably the best thing about these coupon sites is that through them, I've found out about places I'd never heard of before, especially various attractions for kids and new places to eat out. And if you want to give your mother a facial and a massage for her birthday without going broke, coupon sites are the best places to look. Using coupon sites properly can save you money and increase your quality of life. So don't give up on them altogether!